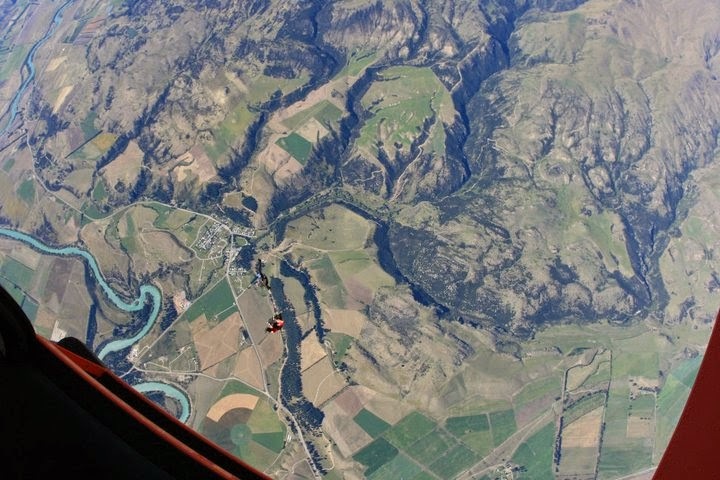 Skydiving at Lake Wanaka - Wow!!!! See the picture above, the little red shirt guy is ME!!!! Wow, this was the most amazing moment I have in Wanaka, New Zealand!! Thanks for the photographer helped me to take this picture, I am really like this image as the great composition and lighting effect on it. 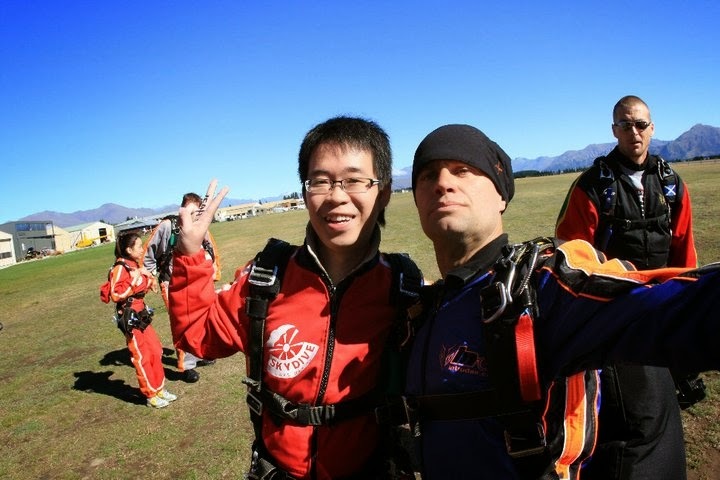 There are few skydiving providers in New Zealand, I have went through some forums and realised that if you want to enjoy the skydiving, you must to Wanaka for your first try. 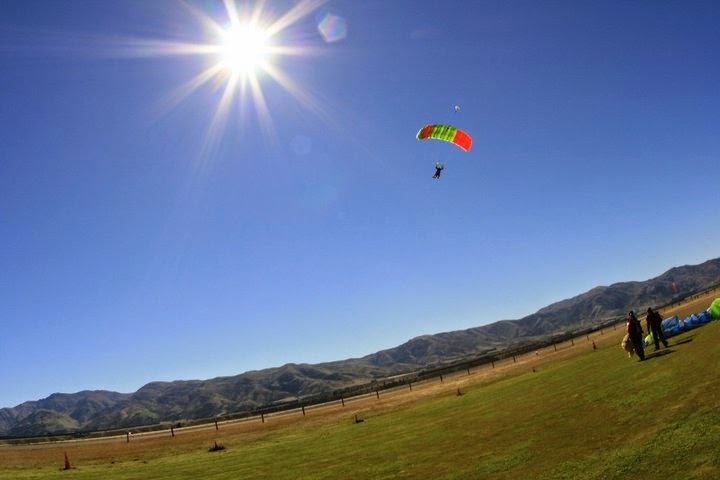 Skydive Lake Wanaka provide you an excellent service, you will find it very interesting, and which is the only one skydiving service provider in Wanaka. For 15000fts, is about 60 seconds while 12000fts is about 45 seconds. This provider actually is having promotion for this November'11, you will enjoy NZ$30 to spend on a Skydive DVD or Skydive clothing at the Dropzone, but only valid in November 2011. 1. your weight may not exceed 100kg. 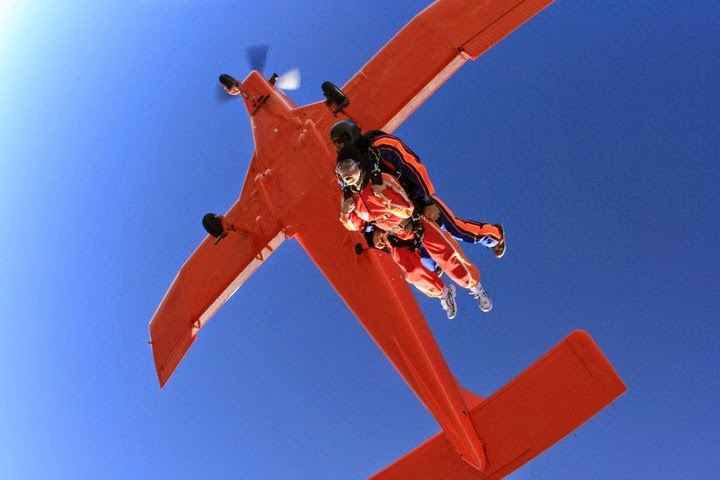 You need to be in a reasonable physical condition to skydive although a physical disability may not necessarily be a barrier to tandem skydiving. (You’ll complete a medical statement before your skydive). 2. For safety reasons you are not able to take anything in the plane with you. 3. You are not allowed to go in the plane without jumping. 4. They do not jump is the weather is not good. However, the general weather in Wanaka is always pretty good, the annual rainfall is low and always has a clear sunny day. I do remember Skydive Lake Wanaka provides free transport for you. They will fetch you from your homeplace to the dropzone, but the location is nearby Wanaka. 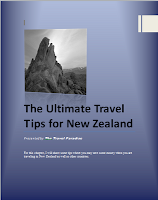 They do not provide free transport from Queenstown to Wanaka. As this activity was not in my initial budget at the first place. We were hesitating whether we want to join this activity when we prepare the itinerary, the cost is really high for both of us, my wife and myself. We still yet decided when we reach New Zealand and only decided to get this on the day we arrive Wanaka after consulted my friends who were having working holiday in New Zealand and their comment is "YES Must Try". Hence, we do not really want to miss out this good opportunity to have this great experience on Skydiving, we joined this finally!! 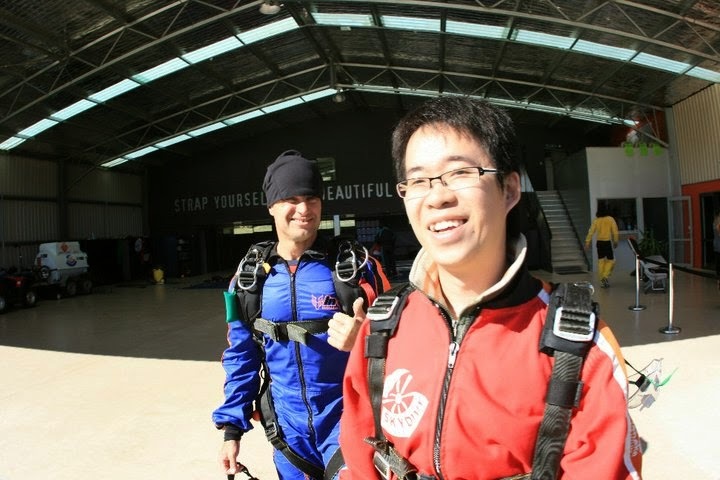 This is my honeymoon, we want to give ourselves a wonderful moment, so we decided to have the jump of 15,000fts and cost of NZ$598 per person which include Cameraflyer Freefall DVD and Picture CD, total had spent NZ$1,196 for both of us... :( but worth!! We stayed in Wanaka for 2 days, the 1st day in Wanaka was a raining day which was not a good weather for skydiving and the service provider did not jump on the day. Hopefully, the next day having a very clear sunny day and with no cloud hanging on the sky, we are considered lucky. 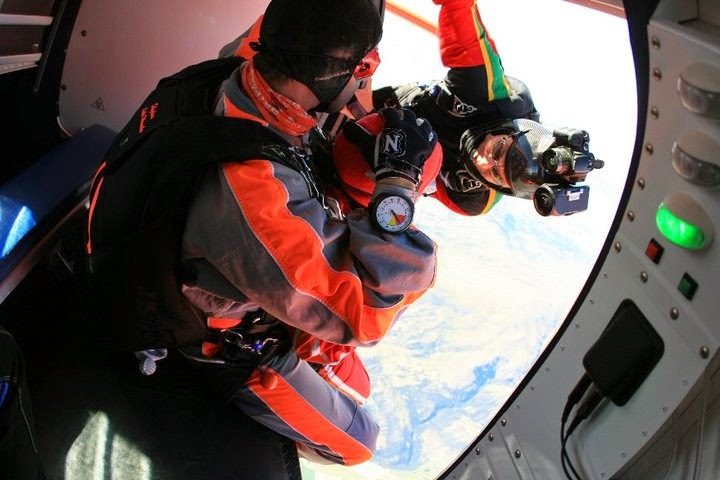 From the Skydive's website adivise that the jumper should check the weather 30 mins before the booking time to ensure they do jump on the day. So, please do it accordingly if you really want to JUPM!!! One of the coincidence was this, I met up my friends from Malaysia where we never arranged, what a coincidence. 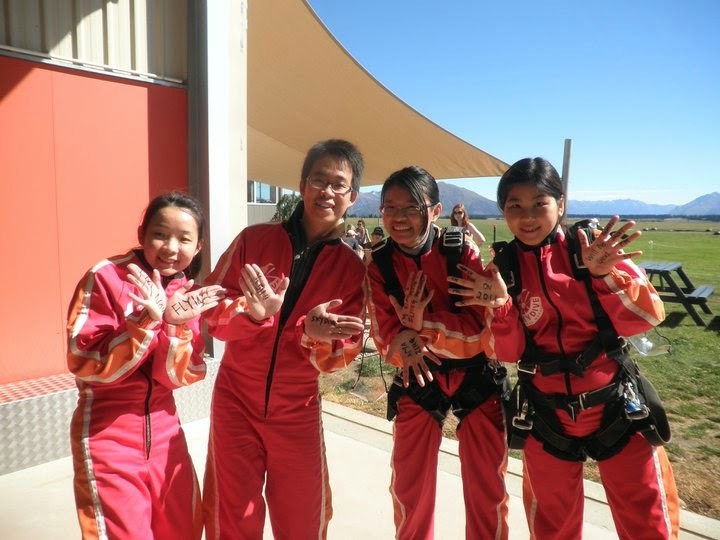 She came New Zealand for working holiday for 6 months and they came for Skydiving on that day, so we jumped together...haahaa!! Is a exciting and happy day!! I do not really advise the potential player to book in advance far ahead as the uncertain weather condition as the weather changing very fast in New Zealand. What I advise that to book in 1-2 days ahead after checking up the weather forecast. Or else, you can walk in on the day actually. I did call up the make booking 1 day before. When I arrived the Dropzone, I was brought to a presentation room which playing the video to show us the technique when we are jumping and on sky (for first time jumper). The video will teach you what you should need to do on plane, and what kind of pattern/body movement when on sky. Some more, the personnel will brief you some terms and condition, you need to sign off the confirmation of physical condition and understanding of the terms of condition. After that, personnel brought us to counter to register and check our weight to ensure not exceeding 100kg. After this, you will be gotten your skydive cloth and accessories, wear it and standby at the waiting area. As the provider only has a plane, we have been waited there for about 1 hour. 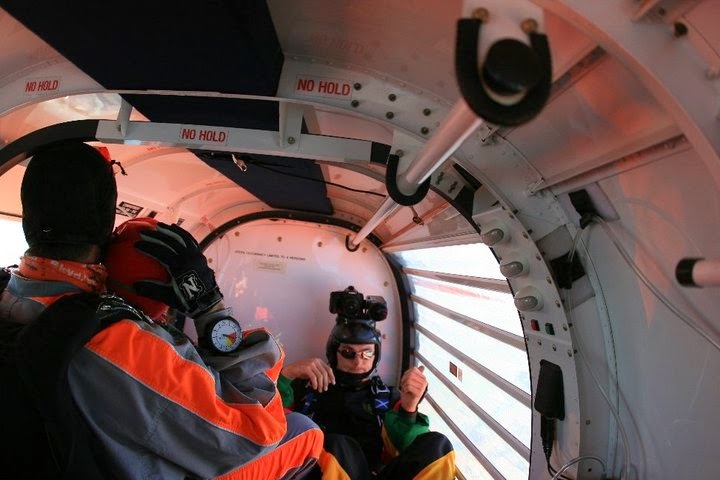 The capacity of the plane is only for 12 persons (4 customers, 4 photographers and 4 skydivers). In between, the skydiver who in-charge the photography and video recording who will interview you with video recording, will chit chat with you, they will make it a bit funny. Now is you turn!!! We embarked on plane and have a sit. The skydiver will take care of you. 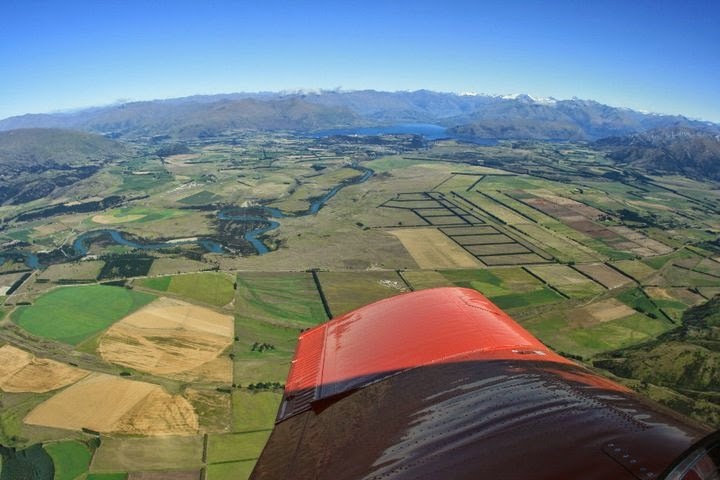 Before jumping, the plane will fly around the Wanaka and keep rising for spending about 10 minutes to reach 15000fts, during this 10 minutes you can view the two lakes in Wanaka, what a fabulous scenery here!!! The skydiver will give you oxygen when reach about 12000fts. Honestly, I was really nervous when reaching 15000fts and was having a bit difficulty in breathing, but getting better after having the oxygen. For the picture and video recording, I am thinking that all are depending on the photographer. Overall, the video and photos taken for my wife are better than mine, And one of my friend having the pictures which have black colour at the conner of all the pictures, is sad, so the service provider compensated a free gift to her. It is depending your photographer's skill. All is luck. 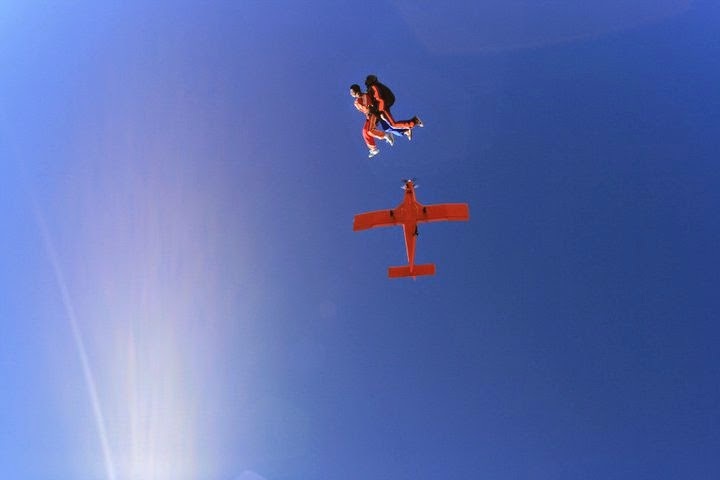 You must try Skydive in Wanaka, this is definitely most memorable memory you will have in your life. Must try once in our life. Go Go Go!!! ya ya ya i tell myself, this is MUST! hopefully the weather is good,.. pray hard! prahy hard, this is really a MUST for me!! Very happy to hear this from you. Dont know why I am having a feeling of touching when I saw this message from you. Great guy, have a next travel plan then!!! ~~ 4月2號那天, 我因為去了pancake rock 所以遲回了CHC, 加上當天6.30天黑, 我開了2小時的山路:( 基本上我被嚇到, 算是很恐怖的經驗. 天黑後真的看不見路 :( 安全抵達CHC 後, 我鬆了一口氣, 只想到要好好感恩我現在所擁有的一切 :) 回想天黑開車的經驗, 現在想起來都會覺得很危險! !